You’ve finished working on your app and you’ve upgraded to one of our paid plans. Congratulations! You’re one step closer to getting your app live in the app stores! The next step is to fill out the Publishing Information for your app and send it off to our publishing team so that they can submit it to the app stores for you. 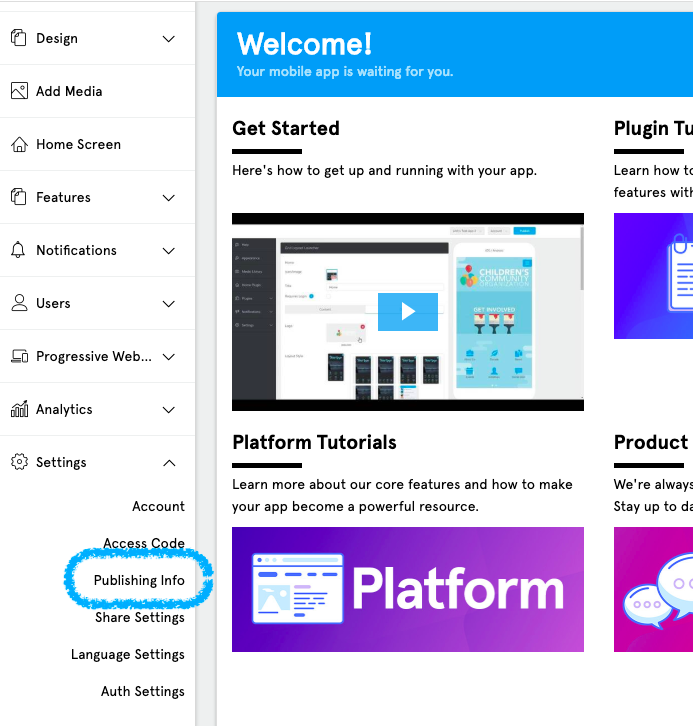 In this article we’ll go over what information we need in the Publishing Information as well as how to fill it out and send your app off to our publishing team. How Do I Get To The Publishing Information For My App? The Publishing Information page can be found by going to Settings -> Publishing Info. What Are The Different Sections Of The Publishing Information Page? Next we’ll go over the different sections of the Publishing Information page and what’s needed for them. Note: If you only want to submit your app to one app store now, and to the other at a later time, you can disable the Apple or Google submission by clicking the toggle button that shows/hides the publishing information for Apple and Google. Then when you’re ready to submit the app to the other app store, simply click the toggle again to show the publishing information section for that store and fill out the information. 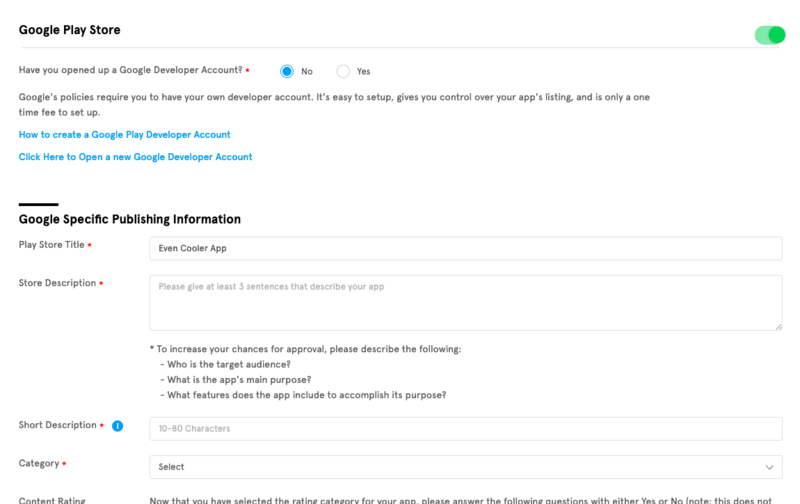 This section is where you will fill out all of the information needed for the iOS version of your app which will be submitted to the Apple App Store. 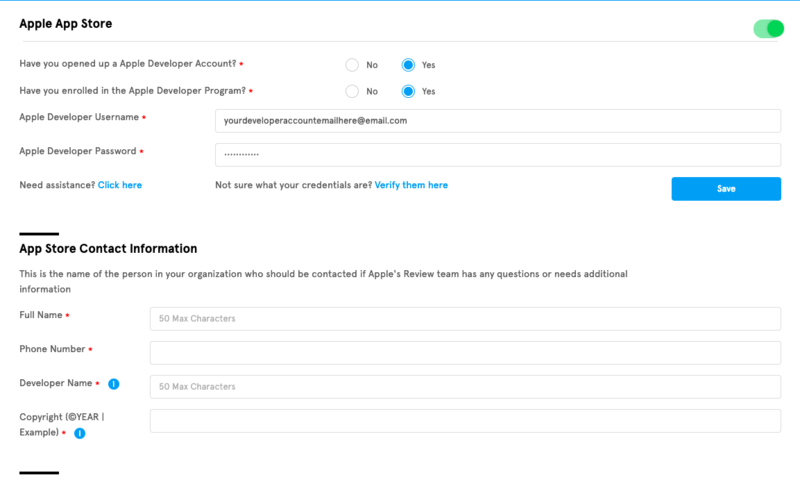 Before you fill anything out, you will be asked if you’ve created an Apple Developer Account and enrolled in the program. If you haven’t already done so, you will need to as it is a requirement in order to submit your app to Apple. If you haven’t enrolled in the Apple Developer Program yet, we encourage you to check out our article that gives you step-by-step instructions on how to do so which you can find here. After you answer “Yes” to both questions you’ll be asked to enter in your Apple Developer Account credentials. In this section you will need to provide the name and contact information of the person in your organization that can be contacted by Apple in case they have questions regarding your app. Go ahead and put this information in the “Full Name” and “Phone Number” fields. Next type in the name that your Apple Developer account was registered under. If it was registered under your name put that in the “Developer Name” field. If you registered as a company/organization, then enter in the company name that you registered the account under. In this section you’ll enter in information pertaining to your app. First things first you’ll need to enter in your app’s name and description in the “App Name” and “Store Description” sections. Who is your app’s target audience? What is the app’s main purpose? What features in your app are used to accomplish its purpose? Next you’ll need to provide Keywords and a Support URL for your app. The Keywords are used to help improve people’s chances of finding your app in the Apple App Store. We recommend that you use keywords that are specific to your app such as its name or what type of app it is (church, restaurant, etc.). The more specific the keywords the better! The Support URL is any website where people can get in touch with you if they ever have questions about your app. It’s always better to use your own website if you can as opposed to using a social media page. You can include a Marketing URL if you want to, but it’s not required. You will also be asked if your app provides unrestricted web access or any link(s) to YouTube as well as access to Gambling and Contests within your app. Select the option that most accurately describes the content in your app for each question. Once you have filled all of that out, you are done with the Apple-specific information needed for your app! Next, let's go over the Google-specific information. This section is where you will fill out all of the information needed for the Android version of your app which will be submitted to the Google Play Store. Just like the Apple-specific section, you will be asked if you’ve opened up a Google Developer Account. If you haven’t already done so, we encourage you to check out our article that gives you step-by-step instructions on how to do so which you can find here. You will also be asked if you have added our publishing email as a Release Manager to your Google Developer Account. If you haven’t already done so, you will need to in order for our publishing team to submit your app to the Google Play Store. If you need assistance with how to do this, we encourage you to check out our article on how to which you can find here. Once you have opened up a Google Developer Account and added us to your account as a Release Manager, you’ll need to enter in your Google Developer Account name and Google Developer Account URL. If you’re not sure where to get this information, we encourage you to check out our article on where to find it which you can access here. Just like the Apple version of this section, in this section you’ll enter in information pertaining to your app. First things first you’ll need to enter in your app’s name and description in the “App Name” and “Store Description” sections. Additionally you will need to enter in a Short Description for your app. This is the first bit of information that people will see about your app when looking for it in the Play Store. Keep it brief and to the point since you have an 80 character limit. 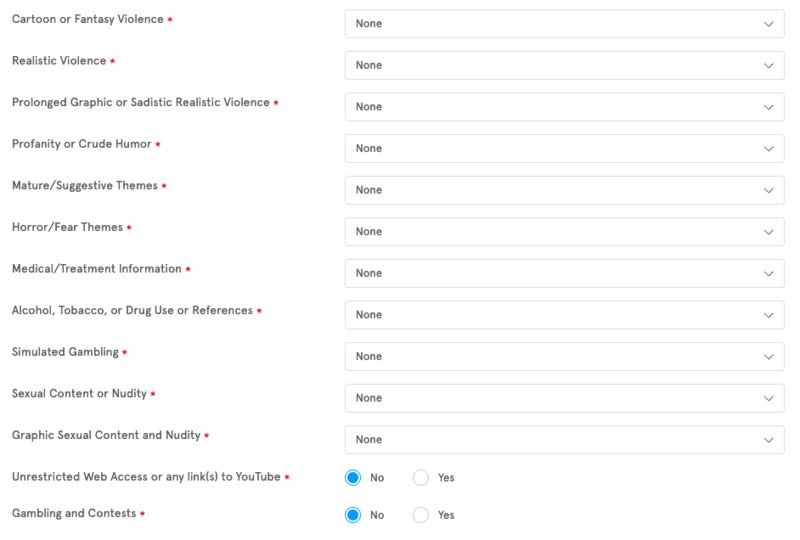 Once you have selected a category for your app, you’ll need to answer some questions about the content of your app such as how much profanity or violence is included in your app. This will help determine your app’s rating in the Google Play Store. You will also need to answer some other miscelaneous questions regarding your app in order for our publishing team to submit your app to the Google Play Store. Once you have agreed to the terms and conditions, click “Yes, Submit For Publishing” and your app will be sent off to our publishing team to submit to the app stores for you. If you’re not ready to submit your app just yet, you can always click “Save, I’ll keep working” and the information that you’ve already filled out will be saved in our system so that you can continue at a later time.